Ryan Kelly spends plenty of time at The Bridge--the oldest bookstore in historic downtown Franklin, Tennessee--remembering the times he and Molly Allen--who moved to Portland--once spent there, and now, with the bookstore in deep financial trouble, it will take a miracle to keep tragedy from unfolding. Molly Allen and Ryan Kelly came from very different worlds, but their mutual love of music and literature bridged the gap. They nurtured their dreams in a Franklin TN bookstore, an institution known as The Bridge, and seven years ago they saw those dreams abruptly change. Charlie and Donna Barton, who built it on faith and love, own the bookstore; they named it The Bridge because Charlie felt that books were a bridge between the past, the present and the future. They never put profit over customers or community and often gave from their own pockets to fill the needs of others, one small miracle at a time. In the aftermath of the Nashville flood it’s now Charlie who needs a miracle and it reunites Molly and Ryan to fight for his cause. What they discover about their past will come as a shock to them both, it will also reaffirm their faith in each other, but it’s what they choose to do with that knowledge that may redirect their future, and will give them both a greater awareness that God truly believes in second chances. This was my debut read of Karen Kingsbury and I can easily see why she has a great following. She combined a story of faith, love, forgiveness and what havoc betrayal can wreck. She gave me characters that were humanized by their faults and who shone because of their hearts. And she gave one very special brick and mortal building a staring role. She told a tale about questioning faith, about miracles and mostly about second chances. She does this with a narrative that’s easily read and enjoyed by all ages and all genders. And to make it even more special it’s a story set during the season of miracles. Weather you’re seeking an inspirational novel, a love story, a drama, you will get all of these and more inside the pages of this novel. Molly Allen and Ryan Kelly came from very different backgrounds but for two years while in school, they were inseparable. Encouraging each other to follow their dreams. One of their favorite hangouts was The Bridge. A local bookstore that was a warm and friendly place to be. A misunderstanding sends them in different directions and though they haven't spoken in five years, their connection still remains very strong. Charlie and Donna Barton are the owners of The Bridge. They love providing a place for folks to come and have some coffee, talk with people and find great books. Then tragedy strikes. The hundred year flood comes through and ruins the books in the store. The insurance isn't enough to cover the damage and the owner wants to sell the property. Charlie hits the depth of despair and feels like God isn't listening. Then suddenly in a moment of time everything changes. Is there really such a thing as miracles and second chances? When I saw the gorgeous cover of this book and found out it was about a bookstore, I knew I had to read it. I'm so glad I did. It was a heartwarming story that follows the lives of four people. One thing I really appreciated about the story was the idea, that you really don't understand the impact a small act of kindness can have on a persons life. Sometimes we get discouraged, thinking it means nothing, but as we see in the story it can make a real difference. I loved watching how the whole story unfolded. The characters were very likeable and realistic. They make mistakes, think the unthinkable, and make wrong assumptions. You don't get any more real than that. Once you step inside the story you won't want leave until the very end, because you become so involved in the lives of these folks. The Bridge will not only pull at your heartstrings but encourage you in your faith. It makes a wonderful Christmas read. This was a story centered around "the best little bookstore in the world" which happens to be in Franklin, TN. It is a story about the dear married couple who have run this bookstore all their married life, and also about two young people, Molly and Ryan, who met, became friends and went through college and thought they fell in love while studying at the bookstore. It is a tender and sweet romance. I loved the way the owners, Charlie and Donna, had such a deep and lasting love, in the midst of struggles and hard times. And Molly and Ryan you knew had a real "heart connection" but through a twist of fate, they never took the opportunity to let each other know excatly how they felt. This was a story that starts in the present, and then has alot of flashbacks to show you how you got to the where you are now. I loved getting to know these people that way. I couldn't read this book fast enough, because I wanted to see how it was going to all turn out. So I recommend you give yourself some time when you start this book, because you are not going to want to put in down until you finish. For the romantic at heart, this is a must read! I want to thank Howard Books for giving me the chance to read this book and review it through NetGalley. It was a pleasure to read and I felt the cover was also a good draw for people to pick up and read this story. Book Summary: Molly Allen lives alone in Portland, but her heart is back in Franklin, Tennessee, where five years ago she walked away from a man she cannot forget, a rare sort of love she hasn't found since. Now, Ryan and Molly's favorite bookstore is in trouble. For thirty years, Charlie and Donna Barton have run The Bridge, providing the people of middle Tennessee with coffee, conversation, and shelves of good books-even through dismal book sales and the rise of eBooks. Then in May a flood tore through Franklin and destroyed nearly every book in the store. By Christmastime, the bank threatens to pull the lease on The Bridge and is about to take the Bartons' house as well. Despondent, Charlie considers ending his life. And in the face of tragedy, miracles begin to unfold. The Bridge is a story of paying it forward, community, and lost love. The Bridge is a quaint little bookstore in downtown Franklin, Tennessee. The owners are a childless couple who have always given to the community. They have always extended a helping had when others were in need but the flood of 2010 destroyed their bookstore. Charlie and his wife do not have the funds to restore the bookstore. While in college Molly and Ryan became friends and would enjoy each other company in one of the upper rooms at the bookstore. Molly was from an upper crust family from the northwest while Ryan is from a poor family in Alabama. Because of manipulations on the part of Molly's father the couple parts ways. I do not want to give too much away to spoil this story for the reader. You will not regret reading this story on how the community comes together to help this couple. You will have to read this book to see if there is hope for Molly and Ryan. You will not regret reading this story. What I liked about this new book by Karen Kingsbury is that it had a beginning, a middle and a end. Unlike some of her other books you will not have to read five or six books to see this story resolved. It's a quick read and you should be able to read it in a couple of hours. It's sure to put a smile on your face. The only criticism I have is that I wish the romance could have been developed a little more. Thanks to Netgallley and Simon and Schuster, Inc. for providing me this ebook to review. This hands down was my favorite audiobook of 2012. This year was the first year that I started getting into listening to audiobooks, because I now have an hour + commute, which cuts down on my actual reading time, so this helps to make me still feel like I'm getting somewhere with my reading goals. That being said I loved every minute of this book, and everything about it, from the characters, to the plot, to the setting of a bookstore called the bridge, I loved it all. 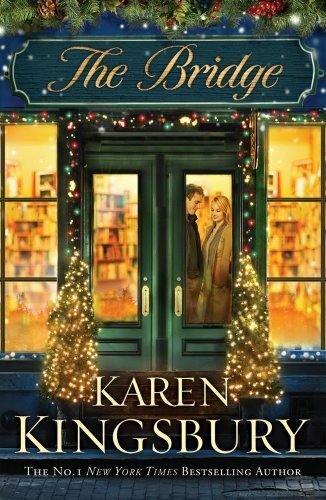 I went into it not knowing what to expect because I had never read a Karen Kingsbury novel before, although I have heard/seen her name around the bookosphere quite frequently. I went into it thinking it would be a light-hearted, fluffy holiday novel that although I'd enjoy, wouldn't have a real emotional connection to, and boy was I wrong. This book made me laugh, cry, reminence, and look forward to the future all at once. The characters were strong and well developed and I felt connected in some way to each and everyone of them, which I feel is rare, usually you can connect to maybe one character, but surely not all of them. The setting was what every book lover in the worlds' favorite place is, and that's in a bookstore, I mean who wouldn't want to fall in love there??!! Short book and I know I like fluff once in a while but this was a bit too fluffy for me. Molly Allen from San Francisco was studying at a south east college-just to get away from her parents for 2 years. They had bought a house there with servants to keep an eye on her. Any dating and she would be sent back home. Ryan from MS is a poor student but plays brilliant music on his guitar. Together they meet at The Bridge which is like a library and they can push one another to go with Plan A and not settle for what their parents want them to do with their lives. Love how the pay forward shows up before it was popular. Hearing about the flooded bookstore made me upset that the bank wouldn't loan them money to replace some books. Love the photo journal/scrapbook and how others pictures and names were in place to show what the bookstore really meant to them. Charlie and Donna Barton know God will never let him fail and there are many times that quotes used from the Bible are posted in this book. After Ryan's band shut down he looked for God to guide him in what was to come next. The scrapbook comes into mind when Ryan contacts people in it to do for Charlie what Charlie had done for each of them. Molly, upon returning to San Francisco had set her father straight as to how things would be. She'd run his charitiable foundations, which he had none of yet, and her soon to be married spouse would run the business. For the first time in a long time I was disappointed in a book by Karen Kingsbury now to be fair I was a huge Baxter fan and maybe because this is different that was part of it but I doubt it. I raed a lot and I either like a book or I don't, I rarely compare them to others by the same author or other books in general. This book just didn't do it for me. I loved the concept and parts of it were very heartwarming but overall it was just ok.
Who doesn't love a good bookstore and the history of this bookstore is amazing. But it just fals short for me. I suggest you read it and see what you think. Molly Allen lives alone in Portland, but her heart is back in Franklin, Tennessee, where five years ago she walked away from a man she cannot forget, a rare sort of love she hasn't found since. I cried, I laughed, I wish there really was a place like The Bridge. I'd want to be there. Very touching story. It's on my read again every Christmas list. Innocuous, simple, light-hearted reading. Predictable. Boy and girl split. Years later the bookstore, and the owner of said store, which they had once loved are going under. Boy meets up with girl and voila! Relationship, etc. saved! This is the prequel to the Bridge, I wish I had read it before the Bridge. The Bridge was not one of my favorite books by Karen but now that I have read this, I think I want to give the Bridge another chance. The Beginning starts with 2 couple who have tradigies happen on the same day and how they end up coming together through the bookstore The Bridge.